The building topped by a white dome is named Palacio Barolo, the tallest in Buenos Aires and all South America, by the time it was completed, in 1923. On top the dome you can see a glass cabin, that is actually a lighthouse whose beacon light can be seen across Mar del Plata, in Montevideo, Uruguay. It is possible to climb up, and enjoy a wonderful view of the city from there. 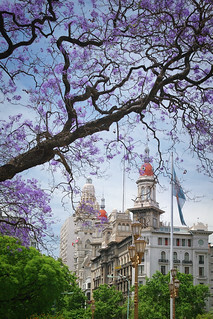 On white || Interesthings || streets of Buenos Aires // Flowers?